Saint-tienne, the hometown of MAS (Manufacture d'armes de Saint-tienne) has been well known in France as the center of arms since the Middle Ages when swords and knives were the forefront of military weapons. Fast forward to modern day and Saint-tienne is still home to the manufacturing of the French standard issue arms. The FAMAS (Fusil d'Assaut de la Manufacture d'Armes de Saint-tienne, in English "Assault Rifle from the Saint-tienne Weapon Factory") is the standard issue infantry rifle of the French military. 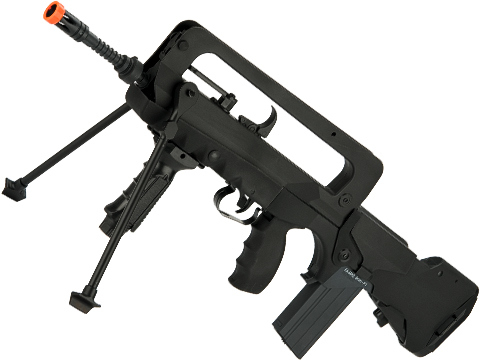 This unique combat rifle is setup in the bullpup configuration to put the action of the weapon behind the trigger; this allows for a standard length or longer barrel to be used while still keeping the overall length and profile of the weapon down to a minimum.